What’s new with PS Bank? Well, I’m sure its loyal patrons and clients will be glad to know. A simpler yet secure online banking from PSBank is here! Designed to provide clients greater access to their trust account, the full-service online investment facility will enable clients to open a PSBank Money Market Fund online anytime. PSBank Money Market Fund is the Bank’s Unit Investment Trust Fund (UITF) that is affordable, prudent and a liquid investment option especially for first time investors. It requires a minimum initial investment and a maintaining balance of PhP10,000, which you can grow in increments of PhP5,000 thereafter. e-Trust will also allow clients to make additional subscriptions, redeem funds partially or fully, view their portfolio, and update their risk profile using their mobile devices or computers, wherever and whenever they want to. “PSBank looks into the needs of our clients and provides them with services that are convenient and affordable while meeting their specific lifestyle and financial objectives. We recognize that clients need to make investment banking transactions in a timely manner. With e-Trust, they can make and fulfill investment decisions whenever they want to. The process is simple, user-friendly, and secure,” said PSBank Senior Vice President and Marketing Group Head Emmanuel A. Tuazon. 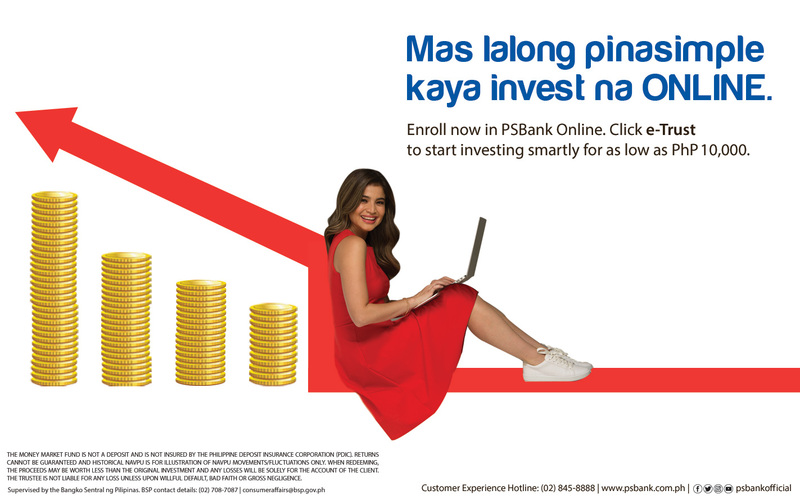 For first time subscribers of the PSBank Money Market Fund, clients simply need to log on to their PSBank Online account, click on the e-Trust module on the left side of the screen and follow the online prompts. Once all questions have been accomplished and the documents are printed, client just needs to visit any PSBank branch for the verification and submission of the documents. Meanwhile, for existing trust clients, they simply need to enroll their trust account via the e-Trust facility and will be able to immediately access and manage their trust account and can enroll more accounts. Developed as part of PSBank’s digitization efforts, the e-Trust module is the latest functionality of PSBank Online, the bank’s online banking platform which enables clients to perform their banking needs conveniently, safely, and from anywhere. Its introduction expands to online investing options available to all PSBank clients. Other services now available through PSBank Online include the PSBank ATM Lock, a feature to lock one’s ATM card to prevent unauthorized usage; and Business Online Buddy, which offers a suite of features for business and commercial clients.